1) Wash the Kosala saga properly. Cut only the leaves and tender portion of the small stems to ½ inch pieces and keep aside. 2) Cut Potato (Aloo), eggplant (Baigan) to small pieces. Cut onion (Pyaaj) to medium pieces lengwise. Heat a pan in medium flame. Add ½ tsp of oil and first fry the cut vegetables. Add Onion pieces and fry. Add tomato pieces and fry. Add little water, if need be. Keep all aside. Put ½ tsp oil and heat. Add washed Moong Dal (3 tsp) and fry. When daal becomes dark brown, shift daal to side of the pan. Add ½ tsp of oil and add Badi pieces and fry. When badi becomes brown, mix with moong-dal and keep aside. 4) Put ½ tsp of oil and heat. Add the cut Sag ( be sure not to add any extra water ), and fry till water starts coming from the leaves. Add the moong-dal mixture and fry. Add potato mixture and fry. A salt to taste,and mix well. Add small quantity of hot water, if need be. Cover up the pan for next 3 minutes. 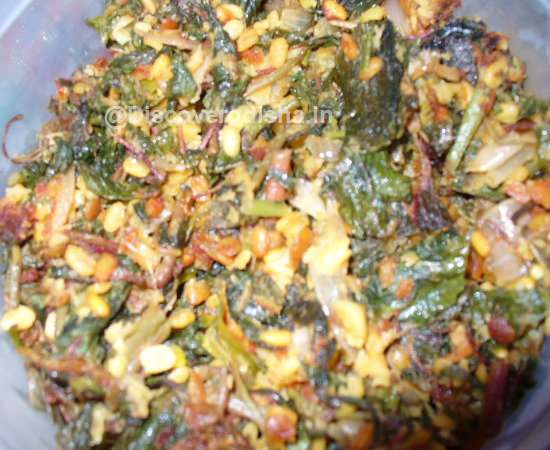 5) In another pan heat ½ tsp oil and add mustard and Saunf seeds, Green chilly pieces, Red Chilly pieces, Garlic pieces, ginger pieces and fry. Add boiled sag mixture . Do not add any more water. Fry it for 2-3 more minute. Tender Koshala Saag (15 to 20 beeda) Medium Pyaaj-2 Aloo-medium size-1 Baigan-medium size-1 Tomato(small)-1 Moong daal-3 tsp Sada Badi-3 Sorisha and Saunf : 1/2 tsp each Kancha Lanka-1 Sukha Lanka-1 Rashuna-5 cloves Ada-1/2inch Salt to taste Oil-2-1/2 tsp in 5 stages of 1/2 tsp each time.